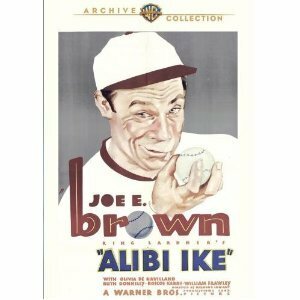 In Alibi Ike, Rookie Pitcher Francis “Ike” Farrell comes seemingly out of nowhere to help the Cubs go for the pennant. His idiosyncratic ways, which include excuses and alibis for everything, drive his manager and fiancee crazy in this baseball farce. Will Joe save the day or will he let the team down when they need him most? ﻿ Baseball rookie Frank X. Farrell is a phenom, a kid who can hurl the ol’ horsehide and swing the lumber so well he may lead Chicago’s beloved Cubbies to a pennant. He can sure spin excuses and blarney, too! Joe E. Brown brings a whirlybird wind-up and a love for the game to this comic Ring Lardner tale. You can’t tell the players without a scorecard but sports-minded moviegoers recognized Bob Meusel, Jim Thorpe and other former professional ball players on the film’s diamonds. But an even bigger treat for viewers then and now is the first screen appearance of a future movie immortal singled out as “a charming newcomer” by Frank S. Nugent in The New York Times. Her name: Olivia de Havilland.